Leaders in Action – Teach. Empower. Transform. Some of you may not know that not only does FLOC have youth afterschool programming in DC, but also in Jefferson County, WV, located just across the Virginia line at the southern tip of the eastern panhandle. 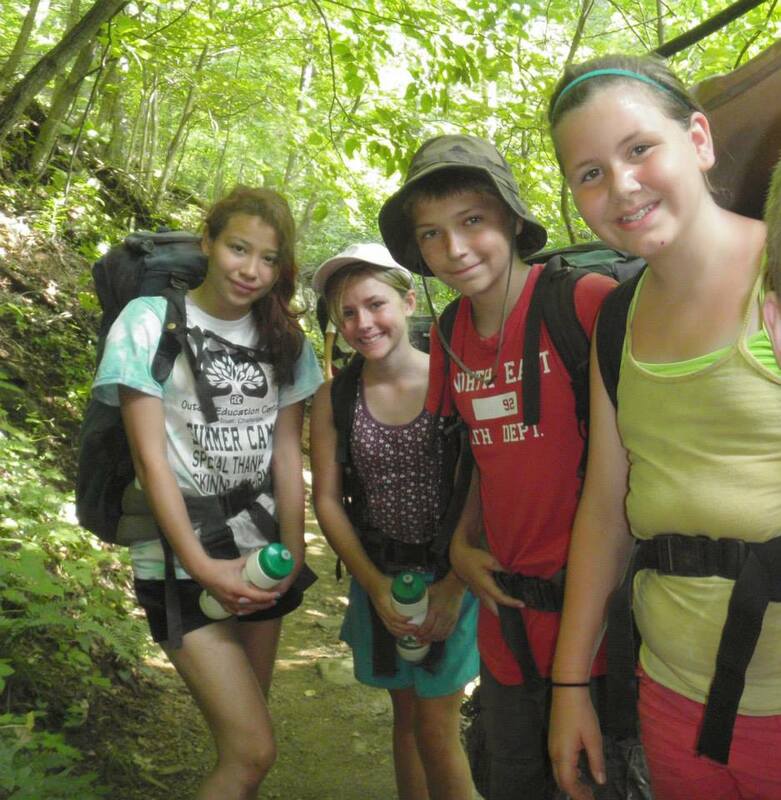 FLOC’s Outdoor Education Center staff facilitate a variety of outdoor and team-building programs as well as host the DC and WV youth during their FLOC summer camps. 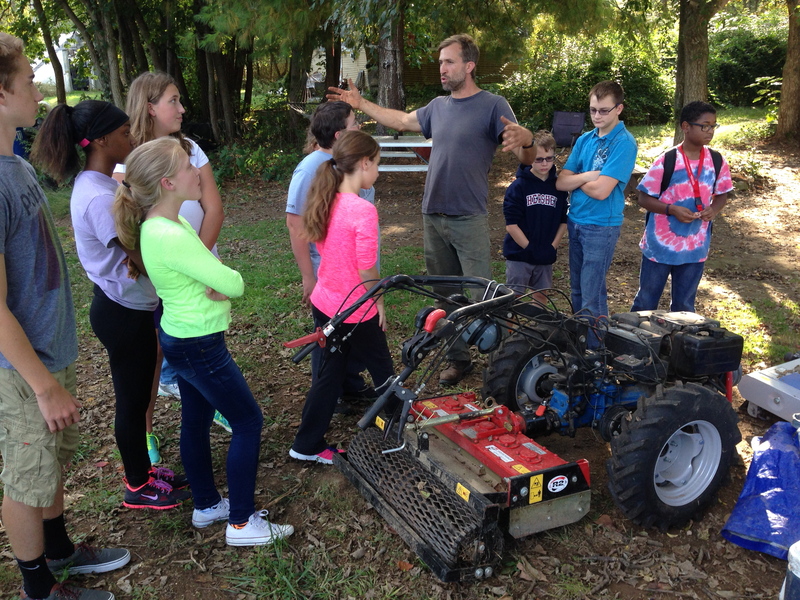 The OEC’s after school program, hosted in two local middle schools, is called Leaders in Action. This year’s program started out with a Civic Engagement and Community Outreach Unit. 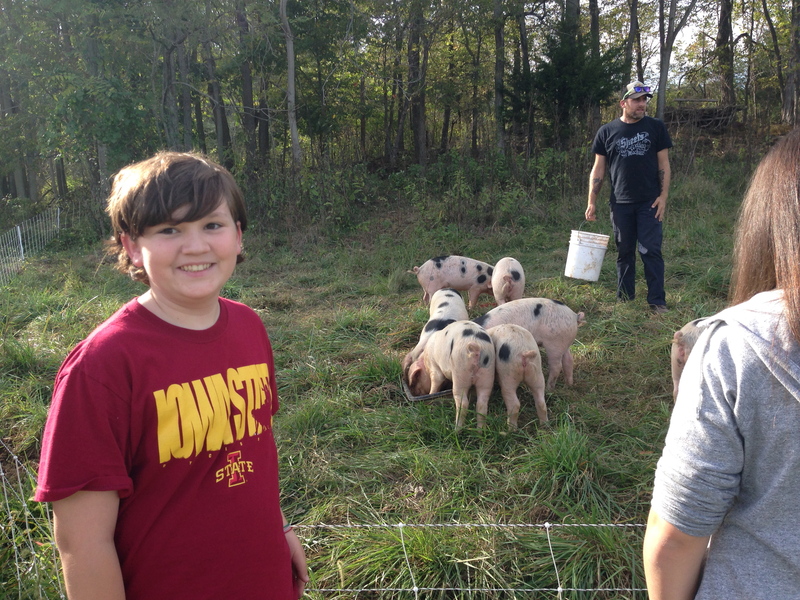 Just by being part of the program the students get to visit local farms, work on crafts for other local non-profit events, and do clean-ups at county parks. 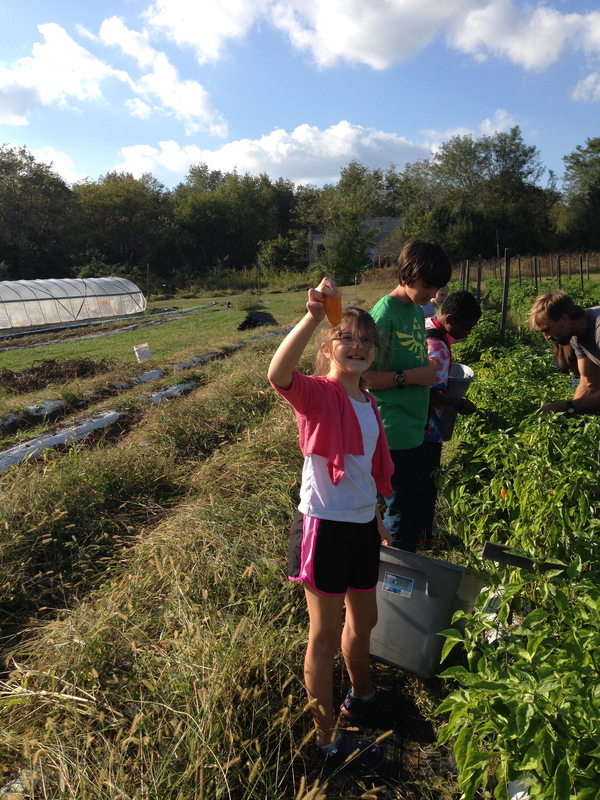 The hope and intention is that through these activities the students gain a greater appreciation for the people, businesses, and resources in their very own community and learn to see themselves as an important part of that whole. Every fall in Shepherdstown, WV, the Freedom’s Run happens, giving our Leaders in Action kids a great opportunity to help out and be a part of the largest race event in WV. As part of the course support for the 10k, the kids this year filled and handed out cups of water, directed the runners through a number of different turns along the course, and cheered on the hundreds who participated in this year’s event. The runners always appreciate the team of helpful volunteers and it’s all for a great cause. The Freedom’s Run Community Grant Fund goes to support school programs, health initiatives, and the building of trail systems throughout the area and it’s all for the greater health of the community at large. 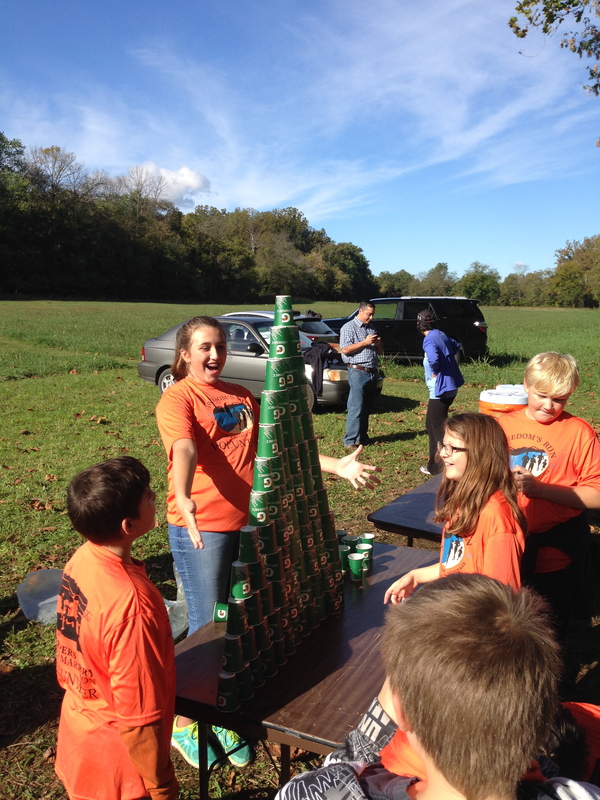 After the last runner had come through, the kids created their own challenge by stacking the unused cups. Sometimes even the value and impact of volunteerism can be learned by just getting engaged and having fun. Great job to our kids and the Freedom’s Run runners. For Leaders in Action, the month of December was our Civic Engagement Unit. Not really a time for the typical lesson plans, but an opportunity for our students to focus on their own community and discover what kind of impact they can really make. Less ‘talking’ inside the classroom and more ‘doing’ outside. The trails and wooded slopes of Bolivar Nature Park got combed and cleaned of any bit of trash in sight. The banks of the Shenandoah River at Moulton Park also got a nice makeover after the students removed at least 4 full trash bags of litter, bottles, paper, cans, etc. These parks are county parks and it was great to make the connection with them surrounding the question of, “Whose parks are these?” The answer was of course, “ours.” They are preserved for the residents of the county to enjoy, care for, and learn from. As we talked a bit after the river clean-up before hopping back into the van, it became apparent just how much had been accomplished in such a short amount of time. When a place is cleaner, others are more likely to take care of it and keep it that way. Part of the hope is that others will see us doing something positive and be inspired to do the same in some unique way. Overall, the students seemed pleasantly surprised at how fun it was to still talk with their friends and get out and move while adventuring through the parks and leaving them better than before. It’s a nice feeling. On December, 9th the Harpers Ferry kids headed to Willow Tree Manor, one of the area’s only nursing homes. The intention was just to spend time with some residents there, especially since some do not have many friends or family, and most don’t get frequent visits by those who care. That dynamic can be even harder around the holidays. The students read books, played a variety of games, decorated cards to give away, or just talked. Some of the girls really enjoyed doing nails for some of the women there, and others eventually played the all-time favorite of bingo side by side with residents. Many of the students did well that day, and we were especially proud of Jacob, Aiden, and Zach. They played “Uno” with one of the residents with such patience and enthusiasm that it really made her day. This woman couldn’t talk and had a lot of trouble communicating in any way, and mostly she was just cheating and throwing cards down to the best of her ability. But the boys handled in so well, encouraged her participation, and talked with her the entire time. She was smiling quite a bit. I’m sure that when we first headed to Willow Tree and walked through those doors that Aiden and the other students weren’t expecting to get much out of it. But that’s the amazing thing about service and civic engagement. We go in expecting to do something nice for others and then often find that the whole exchange and experience of it helped us to change in the process too. It was a cold (but not too windy) Saturday morning in November. About 200 kids and adults gathered at the Sam Michaels Park in Jefferson County for the Wee Warrior Dash. Some of the staff here at FLOC’s Outdoor Education Center voluntarily help to organize and put on the free event for kids, and we invited any of our after school program kids to join us for the fun. This year, Iann and David, two of our Leaders in Action students, adventurously came out for the morning excitement. “Would you do it again?” I ask. 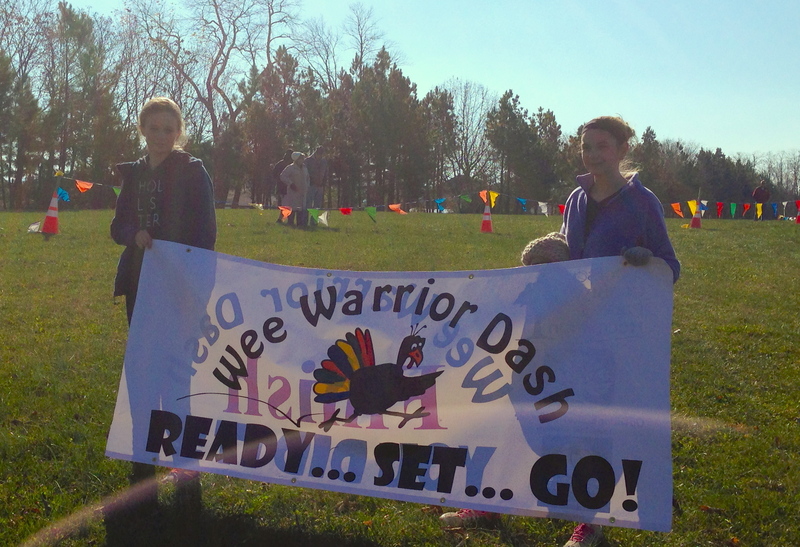 Without hesitation David answers, “Yes.” That’s the real goal for such an event like the Wee Warrior Dash or our running club. It’s challenging and fun, and we aim to inspire more kids to learn to enjoy physically exerting themselves for the sake of their health, enjoyment, and confidence knowing that they can overcome all sorts of challenging obstacles if they just try their best. We are certainly proud of Iann and David for giving it their best that day. Despite the obstacles of school cancellations due to snow and ice so far this year here in West Virginia, the months of January and February continue to be our time of making global connections with our Leaders in Action students during our geography and cultures unit. This past Wednesday, we kicked off the intro lesson with the continents of North and South America. Our students enjoyed a game show style quiz activity where a picture was displayed and their teams got points for putting up the correct paddle of either North, Central, or South America. They learned about the Inuit peoples of the north and were taken along hikes up a couple of Alaska’s most beautiful mountaintops. During the second half of the program, they found themselves jogging with their bags and backpacks through the school halls to get a taste of what it might be like to be a young Chasquis traveling dozens of miles in a day throughout the mountainous road and trail systems of the Ancient Incan Empire to deliver precious goods and important messages. Next, a photo slideshow of Peru exposed the colors and customs there, along with the multi-day backpacking trip it takes to see the perfectly stacked walls and elaborate structures of Machu Picchu. Even the snack for the day included tea from South America and Salmon Dip and Crackers for a taste of Alaska and the Inuit diet. In Winter, being cooped up in a classroom can be a tricky and challenging learning environment, and we aimed to make up for what might have been lacking with the use of presentations, pictures, music, video clips, foods, and the power of storytelling through personal experiences. Overall, the goal of these lessons is to enhance students’ appreciation for cultural differences and commonalities, spark their intellectual curiosity for worlds that are new and unknown to many of us, and even grow their sense of belonging with discussion about our very own local geography and culture. Zoe is one of our 8th grade Leaders In Action (LIA) students. When asked what she has learned the most through LIA, she responded, “Leadership. I have learned more about group dynamics and that in order for a group project to get done there has to be leaders and followers. I know now how to be a part of a group and how to work together, like when we do big projects, how to work with other people to get things done,” Zoe says. 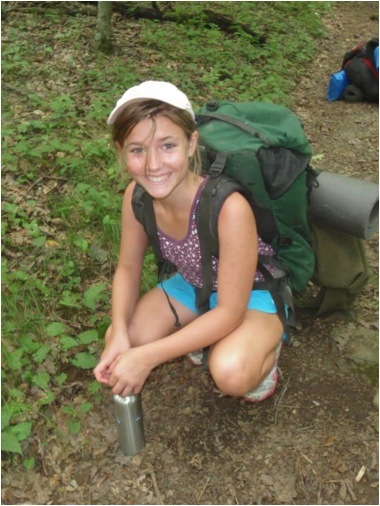 Another favorite of Zoe is “while we are learning all these fun things we also get to earn points to go to summer camp.” Last year Zoe earned the chance to attend our summer camp at the Outdoor Education Center (OEC) and is very much looking forward to returning this summer. This year our LIA program is actively involved with the seven dimensions of health: physical, social, emotional, environmental, spiritual, intellectual, and occupational. Students will have many opportunities to participate in community events, visit organizations on field trips, and host local guest speakers. To kickoff 2014 LIA students have already participated in their midyear fitness test and have shown great improvement since the beginning of the school year. Zoe says, “I like the snow, but I wish we did not have as many snow days because I miss Leaders In Action and want to get back to learning more cool things.” For more information about Leaders In Action visit: http://flocoutdoors.org/youth/leaders-action. 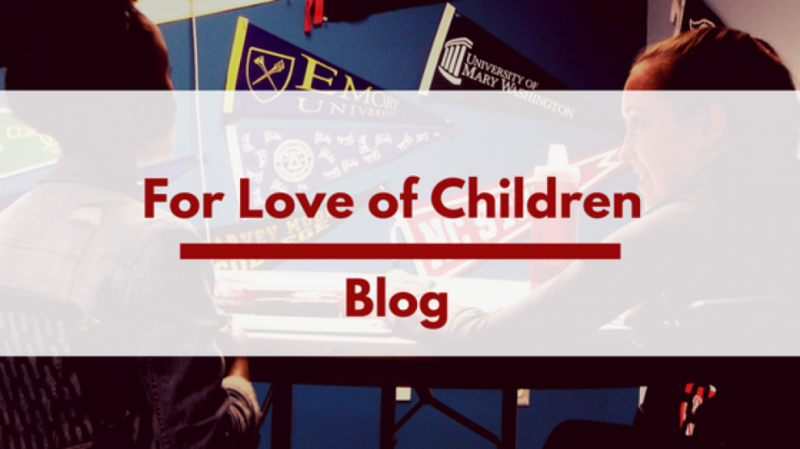 (Kate Nelson is an AmeriCorps Vista at FLOC’s Outdoor Education Center).